Ever since we moved to Florida 3 years ago, I’ve wanted to visit Amelia Island. I kept hearing about how it was incredibly beautiful unspoiled piece of land where southerners and Floridians went to vacation. We finally decided to use our Spring Break to visit the fabled island with our kids, and were lucky enough to be hosted by the Omni Amelia Island Plantation Resort. We were only on Amelia Island for 3 days, but in that short amount of time we could tell that it is one of the most relaxing and kid-friendly destinations we’ve ever visited. If you’re looking for a quiet and relaxing spot for a family vacation, you should absolutely consider Amelia Island. And there really is no better choice than to stay at the Omni if you’re traveling with kids. 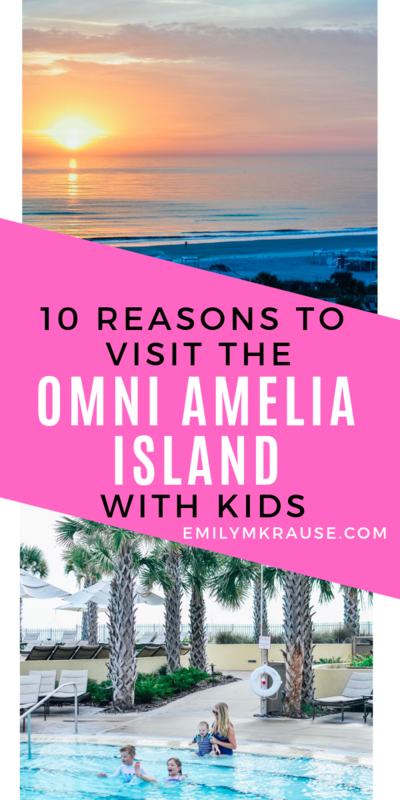 I’ve got 10 reasons you’ll want to stay at the Omni Amelia Island Plantation Resort for your next family vacation. Disclosure: We were very kindly hosted by the Omni Amelia Island Plantation Resort in exchange for a review, and all thoughts and opinions are genuinely my own. We truly loved our stay at the resort and I’ll give it glowing reviews to anyone who will listen! Normally when I visit nice hotels with my kids the staff will barely acknowledge them. If anything they’ll smile politely in my offspring’s general direction and murmur a halfhearted compliment that they’re “cute” (likely while watching in horror as my youngest tries to go boneless in order to escape the confines of his stroller while shrieking, “Down! Down! Down!”). At the Omni Amelia Island Plantation Resort, every single staff member we encountered stopped what they were doing in order to speak directly with the kids. They asked them questions about our plans for the day, if we had ever been to Amelia Island, how they were liking their time at the hotel, etc. etc. Not once did I feel unwelcome or like I had to apologize simply for the presence of my 1-, 3-, and 5-year-old. It was so refreshing that the workers at the Omni understood that kids are a part of life, not a pesky nuisance to put up with and keep out of sight from the “real” hotel guests. Most of the time it was a very small gesture and only took a few seconds out of the staff member’s day, but it made a huge difference in how at home we felt at the resort. If you’ve ever stayed at a hotel with turn-down service, you know that it’s kind of the best part of the day. Maybe you’ve been out exploring all day, and it’s that time between lunch and dinner when you’re starting to get hungry, thirsty, and you want to lay down to rest but you know you won’t be able to get back up if you do. Then a magical fairy brings sustenance to your room to breathe life back into you and energize you for the rest of the evening. Think of how much joy that small moment brings you. Now imagine a kid feeling that special and that excited. What a cool experience for them! On the first night of their stay, kids get a gorgeous spread of cookies and milk to enjoy. You can imagine what a wonderful surprise that was to come back to after dinner, and how it made the bedtime routine so much more fun. The first night in a strange bed can be tough for anyone, adults included, so it’s such a thoughtful touch to welcome families with sweet treats to make it a little more cozy. We stayed in a Deluxe Ocean View Room (it sounds fancy but it’s just the name for the normal rooms) and enjoyed the fact that even though we had a crib in the room for our youngest we didn’t feel like we were climbing all over each other to move about the room. The website says the rooms are 425 square feet, but in family speak that’s 5 humans, 5 suitcases, a cooler, a double stroller, a crib, and an untold number of pillows, blankets and stuffed animals without feeling cramped. If you have a larger family, there are suites and villas available on property so you can put your kids to bed in a separate room and stay up later than 8 pm watching tv or sipping a glass of wine. Might I add that the beds were insanely comfortable? We all slept so well, and the curtains did an amazing job of keeping the room blacked out so the kids would sleep longer. When you walk out onto the pool deck, the first thing you’ll notice is a serene infinity pool and luxurious hot tubs. Keep walking, mama. That’s not your scene. (Come back without kids to enjoy that part). The infinity pool is adults-only, which I actually kind of like as a parent. That way I know there won’t be childless adults glaring at my kids splashing and screaming in the pool! Past the infinity pool you’ll find a spacious heated pool for families, and a little past that is a fun little splash pad area that kept my kids entertained for hours. They’re super close to each other so you can easily walk back and forth between the pool and splash pad all day long. There are countless lounge chairs around the pool, so don’t stress about getting out to the pool early to reserve one. Although, our kids get up earlier than the average citizen, so we were the first ones at the pool anyway. There’s a tiki bar and grill near the pool area, so you can order food and beverages from your lounge chair if your kids will let you sit still long enough to enjoy it. The pool area closes at 7, which we appreciated as parents because there weren’t loud pool parties keeping our kids awake. My kids have taken to calling the Omni Amelia Island Plantation Resort “the beach hotel,” which is accurate since resort guests have access to 3.5 miles of private beaches. This is no South Florida beach covered with tourists and barely a square inch of open sand. No, ma’am. This is an unspoiled, secluded plot of sand and sea where you can hunt for seashells and shark teeth, go for long walks (not romantic…just to tire your kids out), and play to your heart’s content. It was a little cold for swimming when we were there (we’re spoiled Floridians by now), but we loved wading through the surf and looking for shark teeth. We didn’t find any, because my kids have a very short attention span, but they are supposed to be fairly plentiful at low tide! You can rent beach chairs and umbrellas, but we decided against it since our children never actually sit still. The hotel hosted our family at the Falcon’s Nest on our first night on property, and we could not believe how good the food was. My husband hasn’t stopped talking about how he had the best burger of his life that night, and I don’t think he’ll ever look at burgers the same way again. I was worried it was going to be a fancy restaurant where I would be sweating bullets while trying to shush my kids, but it was, in fact, a laid-back family-friendly spot with excellent kids’ meals and awesome service. We found out at the end of our meal that the waitress actually had no idea that I was a travel writer, so I know she wasn’t just putting on a show for us (which I suspected at first because she was SO THOUGHTFUL AND NICE). When she came over to take our drink order, she suggested putting the kids’ meals in right away so they wouldn’t get to restless. WHY HAVEN’T I EVER THOUGHT OF THAT YOU GUYS. She was right. It was the best idea ever. Within 10 minutes our kids were happily putting too much ketchup on their French fries and allowing us to have an actual adult conversation. It was amazing. In case you’re wondering, I had the 12 Hour Brisket Tacos which were quite juicy and very delicious. 10/10 would recommend. The Omni Amelia Island is a 1,350 acre property and has 11 restaurants, a spa and salon, a fitness center, a nature center, tennis courts, a golf course, hiking and nature trails, indoor and outdoor pools, 3.5 miles of beaches, a kids’ playground, a Game Center, and mini golf. You can rent golf carts, bicycles, Segways, kayaks, paddle boards, and fishing gear. You will never get bored here. You will never run out of things to do. You could explore for an entire week and probably not see or do everything the Omni Amelia Island has to offer. We stayed for 2 nights and felt like we just uncovered the tip of the iceberg on our short visit. We were not surrounded by rowdy youths or gaggles of tourists. We had no problem putting our kids to bed at 7 p.m., even though our hotel room overlooked the pool area. The property is so huge that even if the hotel were at full capacity, there would still be plenty of space to enjoy peace and quiet. On the flip side, sometimes our own kids are the ones making all the noise, and we worry that we’re disturbing everyone else. The place wasn’t so prim and proper that we didn’t feel like we could let our kids be kids. There’s nature everywhere you look! (But not in a bad way like when I stayed in a jungle hut in Ecuador and had bugs larger than my hand lounging directly above my bed and tarantulas vigilantly guarded the entrance to the bathroom). From the wild ocean to the serene live oaks dripping with Spanish moss, from sluggish sea turtles to every variety of bird you can imagine, from shark teeth on the beach to quiet nature trails, you’ll find it all at the Omni Amelia Island. Actually, now that I think of it, my husband and I are convinced we saw a bald eagle soaring above the pool one morning. We took the kids to the Nature Center on property to meet some of the rescued animals living there. You can take lots of different tours through the Nature Center to learn more about the flora and fauna of the area. We didn’t have time on our short visit, but I really think it would be interesting to the whole family! Yes, the Omni Amelia Island Plantation Resort is one of the nicest hotels I’ve ever had the privilege to stay at. However, it didn’t feel pretentious, which is really important to me. I grew up with 5 sisters. Whenever we traveled, our family of 8 never stayed at luxury resorts. So there are times when I feel out of my element at extra fancy hotels. I never had that feeling at the Omni Amelia Island. I felt relaxed and well taken care of, which is a tough feeling to come by as a mom of young children. Honestly, staying at the Omni Amelia Island Plantation Resort was the closest I’ve felt to being “on vacation” with my kids along. Not quite, because one-year-olds are terrors wherever you go, but really really close.